“Is it worship when it's done in a temple built by convict labour?” I cannot help the thought, reading the plaque in the nave of the cathedral. “Inappropriate question,” I tell myself, and turn my gaze to the stained glass windows. Bright light has bleached the colors. Four, five believers sit in the pews, praying, while a half dozen photographers prowl the aisles, hunting for the singular shot. One among them is focused on the patterned hassocks. I wander, and take a few pictures. Soon, I get looks from a pair of cameramen with two DSLRs each hanging down their necks. They want the spot I’m on. They glance at my hand phone, and I at their shin-length slacks and the tie-strings jutting out their hems. I move in the direction of the best equipped man there, a Japanese in a khaki vest who has three cameras, who is shooting with the iPhone as well. I smile; he bows; his dead-serious face doesn't change expression. The Cathedral was originally designed by George Coleman. Its present form was built by Indian convicts in 1861. It is a lean, tall, lovely building, and I’d love to stay in the cool of it — but to the streets I belong. Going south alongside the Padang, on St. Andrews Street, there’s on my right the National Gallery. One part of the Gallery used to be the Supreme Court, the other part the City Hall. The buildings have been ceded to a higher purpose, to the arts. The new avatar is a tasteful makeover, a fitting home of the arts. The stairs before the Gallery are taken by a crew of guest-workmen who have set up a rig on them, rendering the front no more photogenic. The tourists have moved to the far edge of the building, so as to keep the steps off their photo composition. These are hallowed steps. Here's where General Seishiro Itayaki surrendered to Lord Mountbatten at the end of the War. (General Thimmaiah, the Indian, was present.) Standing on these steps, in 1965, Lee Kuan Yew declared Singapore’s independence. I come round the Gallery, and there’s the Supreme Court a short distance back, stern and strange with a concrete flying-saucer on top. And a few steps further, there's a compact white neoclassical, with a petite black elephant on a high pedestal before it. This is the Arts House. The elephant is a gift from King Rama of Thailand, made at the time of his visit to the island in 1871. The Arts House used to be the Parliament House until 1999, when the parliament moved to a larger accommodation right across. I cross the street where I shouldn’t, toward Parliament Building, feeling guilt about being bad in this proper city. There’s nobody around the Parliament House, just another crew of guest-workers with a Chinese supervisor, attending to the gutter before the porch. The building tends toward a corporate-style, emphasizing function over everything else. It stands by the Singapore River, and there I sight scattered tourists. I climb down to the promenade and lean on the rails. The first tourist boats are out. After a while, the statue of Raffles lures me from a short distance out. The statue has changed somewhat. They've painted zebra stripes on Raffles’s front. I try different angles to make a good picture. A local Chinese holding a Fujifilm comes up. He points to a marker on the ground. Seen from there, the black stripes on the statue align with the horizontal lines of the OCBC Bank building on the far bank. 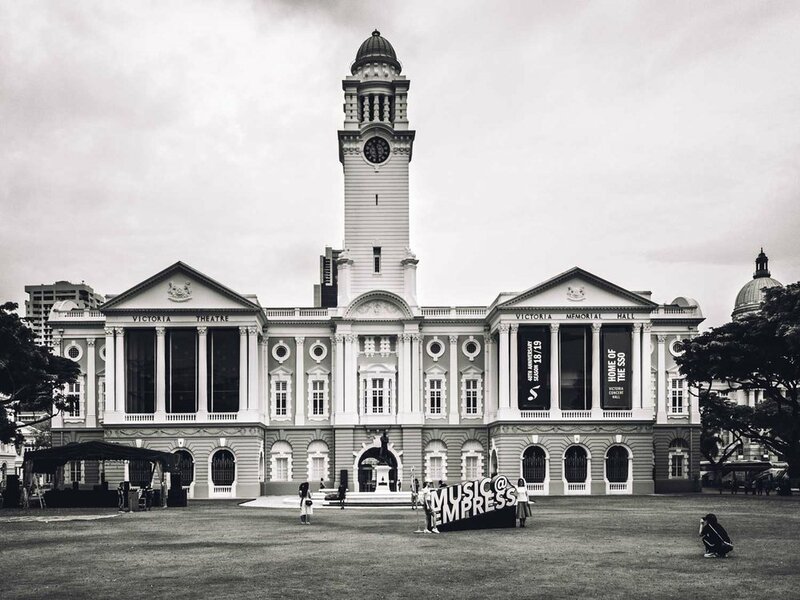 Raffles is now one with the building — a surreal illusion, a pleasant one. I follow Raffles’s gaze and am soon before the Asian Civilizations Museum. This one’s a beauty, and it is in a fine spot before the Cavenagh Bridge and the Singapore River. The tourists love it, you can tell by the numbers. Many of them are on the lawns before the museum, catching on camera their reflection in three silver globes there. A half dozen Germans pass me, see how they can fit all in one compact composition on the spheres, and begin to contort themselves into many forms. This is a lovely sprawl I’ve arrived in. There’s the Victoria Theatre on the next lawn. An all-black stage is taking shape for a concert coming up before the theatre, and men are dusting and laying green sheets on the grass front of the stage. There before the porch stands the original bronze statue of Stamford Raffles, looking from a height toward the river whence he arrived, a slick young man much revered by free Singaporeans, ever grateful to him for founding their island nation. There cannot be a statue of old man Raffles — a brain tumor brought him down at age 45. And there’s an obelisk too, a high white one for Marquess Dalhousie who visited Singapore mid-nineteenth century. Anything for Dalhousie wouldn’t find favor back home in India, where he was Governor General, and where with his invention — the Doctrine of Lapse — he deftly extended Empire. The lawns of the Theatre yield to the long narrow Esplanade Park. Here a pagoda in Italian marble marks the martyrdom of Lim Bo Seng, who led the resistance to Japanese occupation in the Second War. He was tortured and killed at age 34, in 1943. A Cenotaph middle of the park commemorates Singaporeans killed in the First War. I pass the memorials without approaching them, noting that Singapore made its share of sacrifices during the two Wars. At the edge of the park stands the Tan Kim Seng Fountain. If shrunk, it would be a fine adornment on any mantelpiece. Three South Asian workmen in blue overalls are washing and scrubbing the blue-white thing to a shine. I’m not sure if it’s all right to take a picture, because the workmen are going to be in it, but I shoot anyway. This post was first published on The Flaneur.